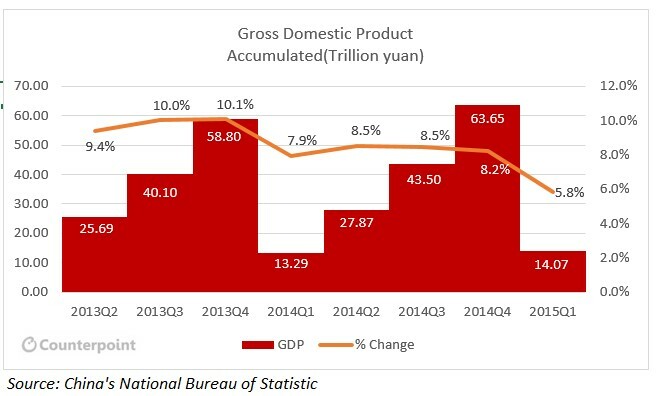 China’s economic growth is marginally slowing down, as per China’s National Bureau of Statistic accumulated GDP growth slowed down 9.4% growth rate in 2013Q2 to 5.5% in Q1205 calculated on YoY basis. This reduction not only a result of increased in base value of GDP but the absolute changes in accumulated GDP, which decreased by ~20% in Q12015 compared to the same quarter in last year. Growth in Per capita disposable income also marginally reduced to 10.1% in 2014Q1 from 11.1% over the last year. While recent stock market fiasco in China also worried the investor community, the equity market only funds around 5% of the Chinese economy whereas majority is led by bank loans, therefore we believe this won’t have a bigger impact from macroeconomic perspective in near to midterm. Furthermore, China, a country with huge saving rate (~50% of GDP) will also help neutralize any after effect swiftly. China grew as a manufacturing hub until the last decade building a global-scale ecosystem of component manufacturing, assembling and supplying leveraging a very efficient & low cost labour environment. However, labour cost has been rising steadily and doubled in last five years which is putting pressure on the local manufacturing base. Also, globally many developing economies are transitioning from hardware to software and services economy as value is shifting accordingly. 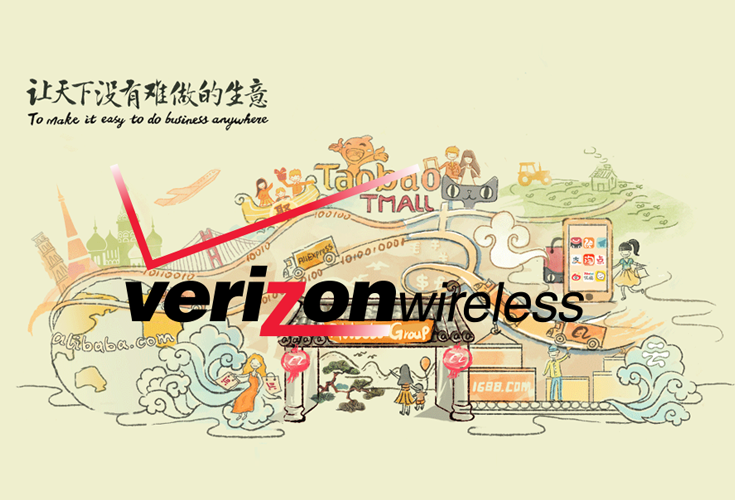 As a result Chinese Government recently announced its “Internet Plus Policy” to ride on this wave and become a significant player in the software and services industry. This benefits not only the foreign technology companies but more so the local tech & internet giants i.e. Baidu, Alibaba and Tencent. Retail and commerce will be one of the biggest sector benefiting from the Internet Plus Policy of China. Smartphone penetration in driving higher internet penetration. As a result, we expect continued growth in internet-based commerce, retail, advertising and services. China’s offline retail is more unstructured the moment and may take most of the blow during this transformation process. Thus, Alibaba is well positioned to further strengthen its position in this space. Alibaba group currently accounted for almost 80% of the China’s online commerce and 2% of GDP of China. 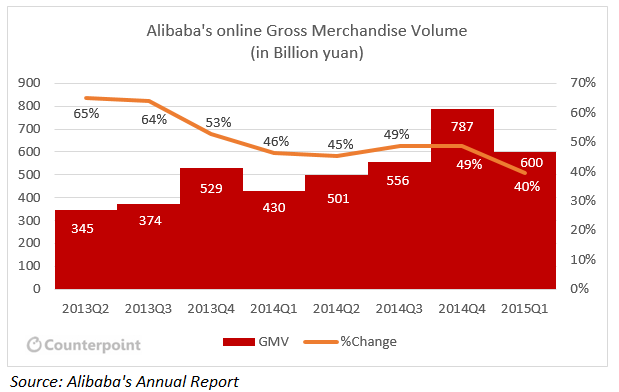 As a result of marginal economic slowdown, Alibaba’s Gross Merchandise Volume growth is also reduced from 65% in 2013Q2 to ~40% in 2015Q1. However, they are growing way faster than their western counterpart Like Amazon and will continue to grow at good rate in upcoming years. Right now, majority percentage of Alibaba’s revenue comes from e-commerce in China (86%) and this is the high time for them to focus on international expansion. However, so far most of the investments from Alibaba has been for beefing up its ecosystem of hardware, content, apps, services which are more relevant domestically and share of international commerce to the total revenues have almost halved from 19% in 2012 to 9% in 2014. Investors are expecting Alibaba to grow outside China and since IPO last year there has been a cautious effort to do so. Is Expansion the only Strategy for Alibaba? Urban market in China reaching its saturation level and focusing on expanding in under-served regions, which accompany 45% of Chinese Population, is a good move. Though, it might look like cost centre in short run for them but a necessary steps to expand its business and stay in a leader position. Alibaba already partnered up with FMCG giant Unilever. On a collaboration basis Unilever will use data from Alibaba’s online marketing unit Alimama to strengthen their strategy and Unilever will help Alibaba to expand in rural region. We will like to see similar alignment and partnership in future to boost their quick expansion strategy. Mobile has already become major sources of online traffic in most of the countries globally. Investment in mobile commerce is not a choice but a must move for every e-commerce company to stay relevance in the game and will be more important as smartphone penetrates rural population. Chinese market is different from any other country and replicating the same approach outside china may not going to be the best-fit solution. Though, Alibaba have experience in online business and have the money muscle, but they are cautious about their steps outside. As most of their business are driven by Chinese brands, which are lesser known and recognized outside china, therefore gaining traction immediately would be challenging. Alibaba will have to create local reseller ecosystem in every country they enter to replicate the similar success. It appears that Alibaba is taking steps to lay an e-commerce infrastructure overseas using AliPay, which is a payment solution of Alibaba, partnering & investing in overseas local players. Alibaba launched a cloud computing hub in Silicon Valley and will likely to create a cloud platform to support operations from US operators who have stores in Alibaba holding companies and operates from USA. An investment by Alibaba’s affiliated financial company in an Indian mobile-payments service (One 97) hints at a cautious attempt for overseas expansion by the company. Alibaba Invested in Paytm (One97) in India to helped them create a platform for seller and buyer and established AliPay footprint in mobile wallet transaction solutions market in India. com launched Spanish-language and Portuguese-language site targeting local customer in the countries in Latin America, especially in Brazil, Chile and Mexico etc. They already became one of the Top 3 online retail player in Brazil. The Internet space is becoming increasingly crowded and acquiring new customers will be a continuous challenge as competitors such as JD.com, Wanda, and Baidu increase their focus on e-commerce. 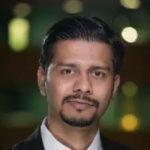 Focusing on retaining existing customers while maximizing revenue through offering solutions in a mobile focus integrated ecosystem will be key. Hardware can be a critical distribution platform (HaaD) for integrated ecosystem players and investment in Meizu is a clear indication in that direction but will face challenges from likes of LeTV & Xiaomi. As Chinese market is slowing down, quickly expanding outside China would be another big challenge for Alibaba. Though, Alibaba could face regulatory challenges related to cross broader trading for Chinese products and resellers into overseas markets. Combating counterfeit products on Alibaba’s platform will be crucial to win consumer and partner mind share and boost Alibaba’s brand identity within china as well as overseas. Alibaba’s Blue Star program is a step in the right direction.